Our Amish Small Arts and Crafts Computer Desk is a beautiful desk for a small office. This computer desk offers a stylish option to set up your laptop for work or daily correspondence. 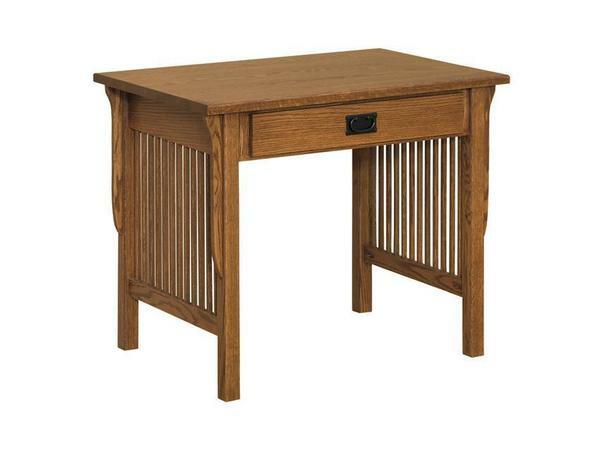 All of our Amish furniture including this mission desk are made in the USA. This attractive mission desk comes with one drawer on full extension drawer slides, allowing you access to the most room in each drawer with no space wasted. Choose to have this office furniture handcrafted in your choice of oak wood, cherry wood or quarter sawn white oak wood. Call to receive finish samples or to receive a custom quote if you are looking for different dimensions. Signature mission style slats are slender, defining each side. This solid wood desk is 36.5" wide and stands 30" high, making it a great fit for a small home office, living room or bedroom. Mission style furniture emerged after the Victorian Era, when a desire to do away with the fussy and ornate was strong. The classic, simple elegance of mission style remains a popular choice today as it blends well with different decor. Browse more of our solid wood mission furniture for other areas of your home and office. I received my desk yesterday and I couldn't be happier. It is beautiful, my husband is very impressed with the craftsmanship and quality of the desk. I was very nervous ordering furniture on-line but my experience with JMX has been exceptional from start to finish. We will definitely keep JMX in mind for purchases in the future and spread the word about your wonderful company.